A very lightly used telephone interface that's in close to mint cosmetic condition. The photos show the actual item for sale. No printed manual is included but a copy may be downloaded here if required. Note that JK Hybrids in my experience operate best with a low level of input signal, so start testing by turning down the Send gain control to the point where just the first LED level indicator is peaking lit. From the front panel you can control on-hook/off-hook, and adjust headphone volume. Front panel LEDs display signal levels and option status. The Send and Caller Volume controls are hidden behind an access panel to discourage unauthorized “tweaking". Five feature switches are also hidden behind the access panel. Caller Ducking drops the Caller output level by 9 dB whenever the host speaks. This keeps the host “in charge" of the show, automatically making sure the caller never overpowers the host by attempting to talk over the host’s voice. Press the “Presence" button and you’ll get a richer sound from the caller’s voice. This digital filter brings back some of the low-end lost in transmission. This wouldn’t be a JK Audio product without its fill of common-sense features. Check out the front-panel headphone jack and volume control. You can monitor either the send signal, the caller’s voice, or a mix of the two. This output is also sent to the rear panel screw terminals so you can easily add a monitor speaker. In fact, several remote control connections can be found on real screw terminals for ease of installation. Three balanced audio connections: mic/line switchable XLR input, XLR caller output and an additional, user-defined XLR output. 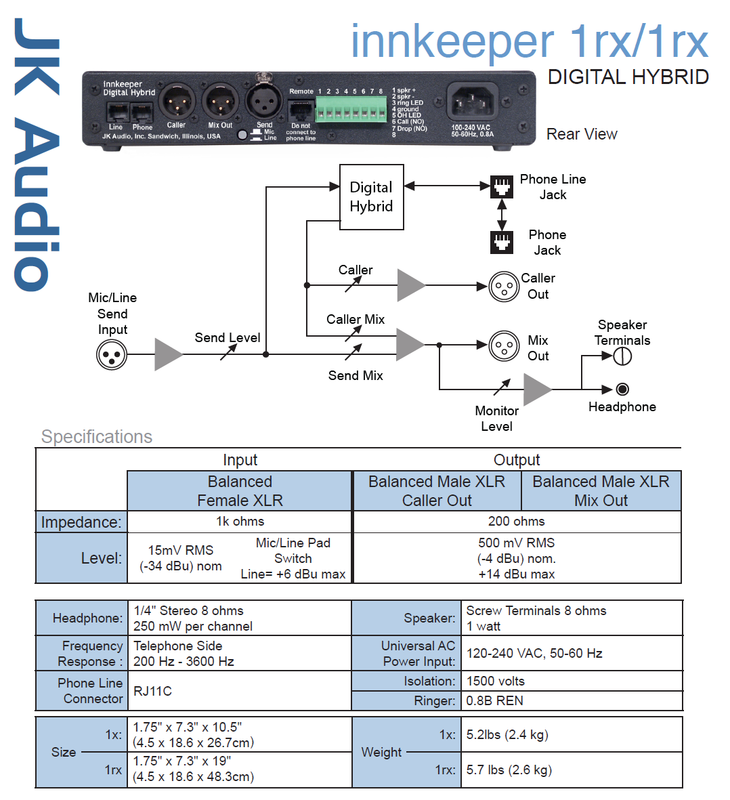 And possibly the coolest feature: the innkeeper 1x can be remote controlled by either the optional Guest Module 1, the RIU-IP remote interface, or the included RS-232 cable. The Guest Module 1 allows remote Call, Drop, and DTMF dialing while the RIU-IP allows control of all functions of the innkeeper 1x through your web browser whether it is directly connected to your computer or via the internet from around the world. The RS-232 cable allows similar control using simple ASCII commands.